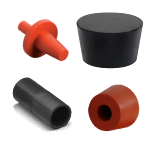 MOCAP manufactures products using the best materials available and those most appropriate for the caps, plugs, grips, masking and protective products you require. From this page, you can select the MOCAP product based on the material from which it is made. 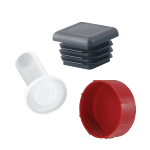 Although most of MOCAP's stock standard plastic caps and plugs are made from Low Density Polyethylene (LDPE), our capabilities include Plastic Injection Molding of Polypropylene (PP), High Density Polyethylene (HDPE), Nylon, Thermoplastic Elastomers (TPE) and virtually any thermoplastic resin. Our families of standard Rubber Products are based on molded and extruded Silicone and EPDM materials, but our capabilities in manufacturing rubber products includes molding a wide range of thermoset rubber materials including EPDM, Natural, Neoprene, Nitrile, SBR, and Silicone. 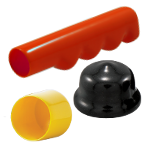 Choose from a wide variety of caps, plugs and grips made from flexible Vinyl (PVC) Plastic. 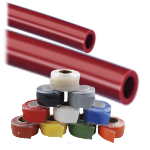 We stock numerous vinyl PVC materials most commonly used to make the flexible vinyl caps, plugs, grips and masking products you need. MOCAP's capabilities are second-to-none. 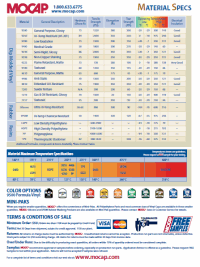 If your product or project requires a custom dip molded part in a special color, hardness or texture, we can deliver. Our paper caps and plugs including Straight Caps and Tapered Plugs are produced using tough, but flexible natural paper. The paper is environmentally friendly, recyclable and can handle temperatures up to 400°F (204°C) . We use the highest quality silicone compounds to produce our extruded silicone rubber products including silicone tubing and self-bonding silicone X-Treme Tape. 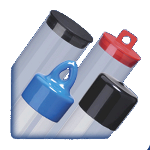 MOCAP manufactures a full line of extruded plastic tubes in Polyethylene Terephthalate Glycol (PETG) commonly used to package products in a unique, highly visible manner.